Thomas Henry Huxley (1825-1895), Biologist and science educationist. Sitter in 48 portraits. John Collier (1850-1934), Portrait painter and writer on art. Artist associated with 21 portraits, Sitter in 7 portraits. Thomas Huxley was a key figure in Victorian scientific life. He worked tirelessly to improve scientific education and served on many Royal Commissions on education and public health. Huxley made important discoveries in several branches of biology and was a vigorous champion of the evolutionary theories of Darwin but tended to antagonise moderate opinion with his aggressive style of argument. He is seen in this portrait holding a skull and resting his arm on a pile of books. 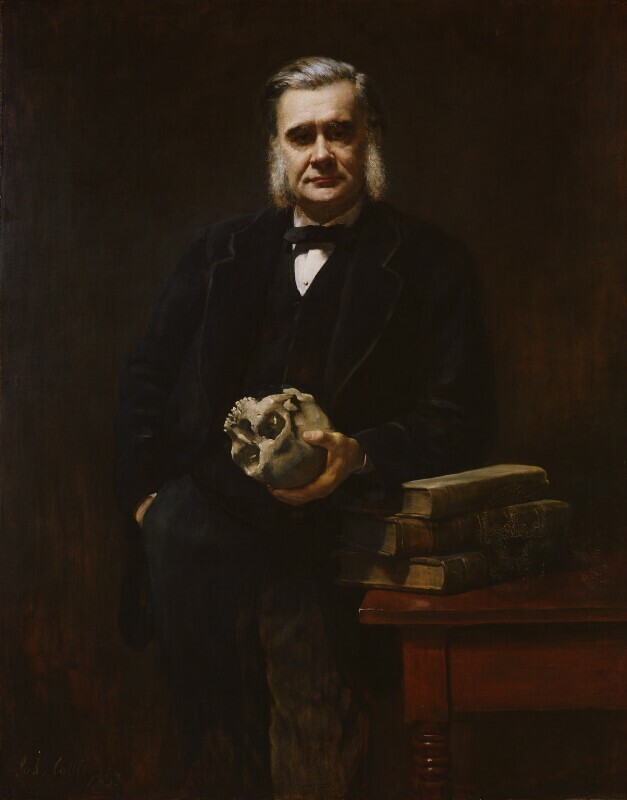 Close examination of the painting reveals that Collier had originally chosen to depict two skulls, presumably of apes, resting on the table.